Monday commenced Seleta Reynolds’ first week as the new General Manager of the Los Angeles Department of Transportation. 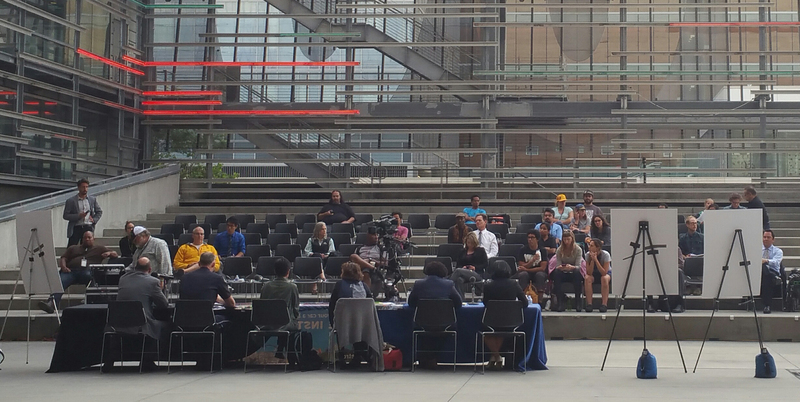 On August 12th, the LADOT Bike Program had the pleasure of sitting down with Ms. Reynolds to discuss a number of topics ranging from commuting, bicycle planning, and direction for the Department moving forward. 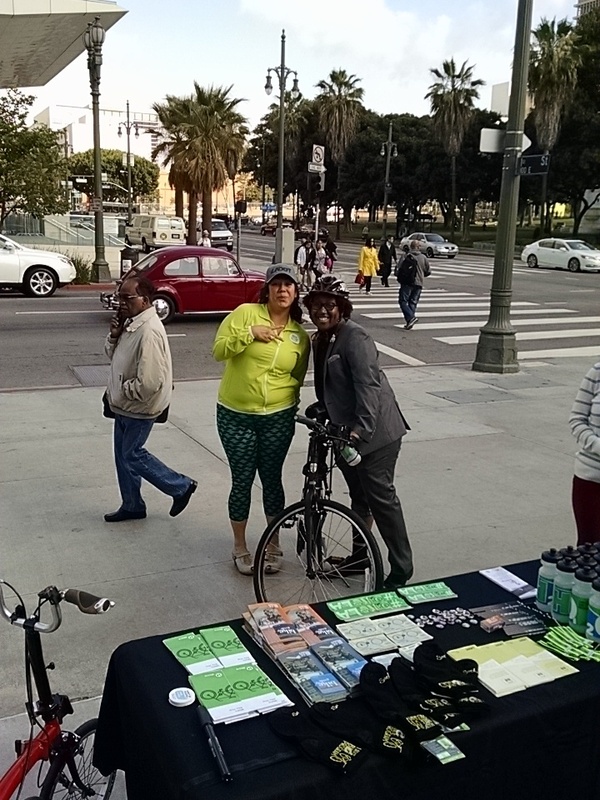 LADOT Bike Program: What was your commute like today? 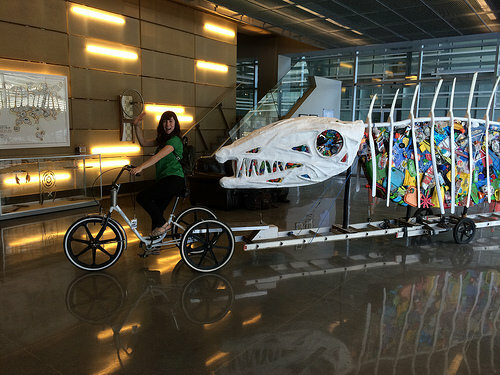 We understand that you rode your bicycle to work on your first day. Generally, how does your Los Angeles commute compare to your SF commute? 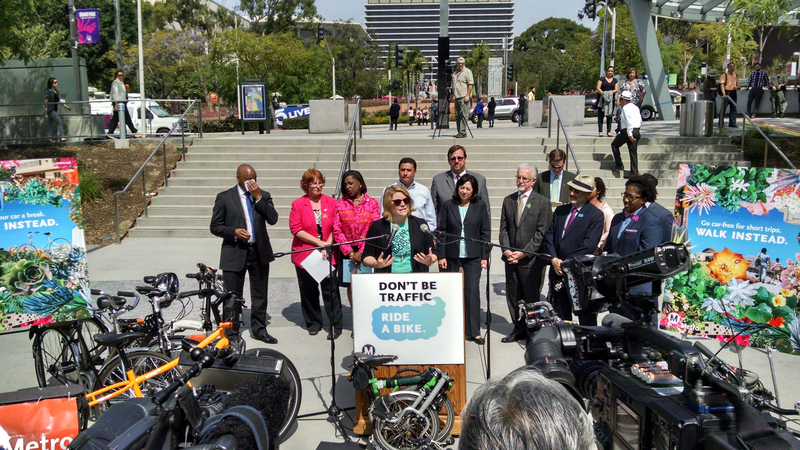 LADOT GM Seleta Reynolds: My Los Angeles commute is already an improvement over my San Francisco commute. I rode my bike in the first day. Some folks rode in with me to show me the ropes, and helped me navigate the streets. It was totally enjoyable and really a great way to start the first day, to get a little exercise and be out in the morning. Today I rode the bus because after dropping my daughter off at school, it was easy, just hopped on and only took about 20 minutes or so. I can also take Metro’s Red Line from where we live. Having so many choices is a huge advantage, and the fact one of them involves riding my bike is just fantastic. When I was in the Bay Area living in Berkeley I rode BART into San Francisco. You cannot ride your bike over the Bay Bridge yet, you can only ride over half of it. Now I have more choices and one of them includes bicycling. LADOT Bike Program: In your experience, are there things Los Angeles can learn from San Francisco when it comes to bicycling? What are some bicycle-related measures from San Francisco that you would like to see implemented here? LADOT GM Seleta Reynolds: Every place is different. I worked in San Francisco for three years and before that was a consultant, working all over the U.S. I worked on a bike plan for the Reno Sparks area, and also on a plan in Denver called Denver Moves. Every place has something unique about it. San Francisco is so different from Los Angeles, mainly because the width of the streets are so hyper-constrained and the topography in the city; it really limits the routes you take and everybody wants to be on those routes. There were some really tough projects and really difficult conversations about reallocating space. San Francisco has a strong commitment to its “Transit First” policy, and a commitment to safety and Vision Zero. I would love to see that rise in Los Angeles, to have that unifying commitment from a policy perspective on all the leadership levels It will be great to have bike-sharing in Los Angeles, especially in Downtown, along with more protected bikeways and better intersection treatment, bicycle signals, two-stage left turns- a higher level of consideration. People encounter bad behavior from people on bikes because there is no system set up for you when you’re on a bike. We have treated people on bikes as either fast pedestrians or slow cars when really they are neither of those things. Giving consideration to that system is important to encourage good behavior, and getting along and sharing the road. LADOT Bike Program: What are some of your short-term and long-term goals for improving walking and bicycling in the City? LADOT GM Seleta Reynolds: Short-term I would like to see us continue to nurture and grow the People St program and adopt a really strong safety initiative, whether that’s Vision Zero or some other initiative we have for improving safety. I think that is foundational, you have to get that right before you can accomplish more. I would also like to see us continue to shift towards moving goods and people. Thinking about the function of streets and how we can provide a street that is comfortable for the folks who are not currently out there riding or walking, understanding what those people want and need. We need to prioritize quality over quantity when it comes to the bike network in particular. Building two miles of high-quality protected bikeways is better than, from my perspective, building 50 miles of five foot wide bike lanes that are just separated from traffic by a stripe. It would be great to change our attitude when it comes to the design principles we use to approach projects. LADOT Bike Program: The City of Los Angeles has a massive footprint, do you have a strategy for implementing the Bicycle Plan while managing other Department initiatives? LADOT GM Seleta Reynolds: Partnerships are key; working closely with the Bureau of Street Services as they’re repaving streets, working closely with the Department of Water and Power on green streets, and folding our projects into those projects. Partnering with Metro on first and last mile solutions to leverage the huge investments they’re making in extending the rail lines. Also, finding private partners, people who have not traditionally funded transportation and to get them to come to the table to work with us on these kinds of projects is the only way we’re really going to get it done. We have to continue to evolve the way we do outreach in communities in order to get further faster. 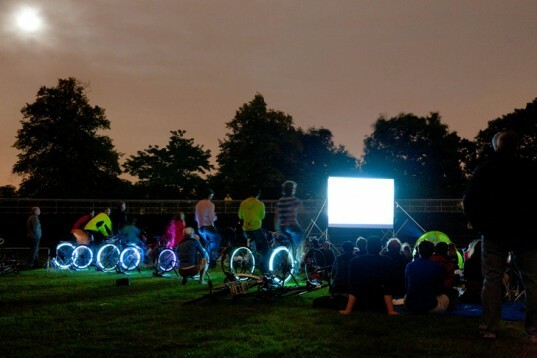 That is something I am really excited to work on with the Bicycle Outreach Program because the program has learned a lot of lessons about what has worked and what hasn’t worked. We need to make sure we are getting that community buy-off as early as possible so that we don’t get stuck in an endless cycle of back-and-forth, which pulls us away from doing other things. LADOT Bike Program: What do you see as some of the differences to implementing bicycle infrastructure here as opposed to your work in San Francisco? 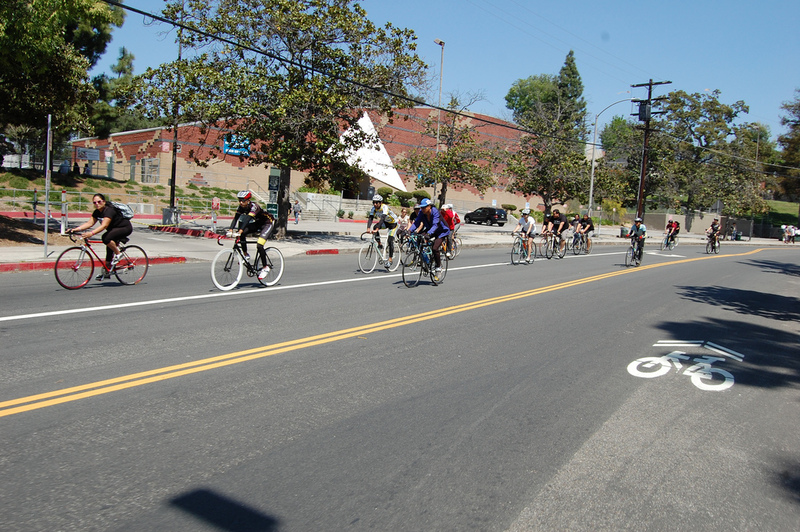 Sign up for LACBC’s September 2013 Bike Count! Data is Important! Over the past two fiscal years, the LADOT Bicycle Program has installed well over a hundred miles of new bike lanes, filling gaps in the city’s bicycle network and enhancing street conditions to make cycling more safe and pleasant. Alongside this effort, the LADOT will also soon be moving forward with highly anticipated bike projects in the city’s first EIR package, marking a huge step forward in the 2010 Bicycle Plan implementation process. However, great as these accomplishment are, we don’t fully know the impact of bike lane projects and neighborhood bike networks unless we collect data evaluating the impacts of all this new bike infrastructure. How do new bike lanes and road diets affect the number of people bicycling on a street? Do bike lanes improve overall street safety? These are questions we need to answer. Additionally, we don’t know where bike infrastructure is most needed, and has the most potential if we don’t know the popular cycling corridors in the city. Simply put, data collection is incredibly important for evaluating the effectiveness of existing bikeways, and determining how best to advance new bicycle projects. 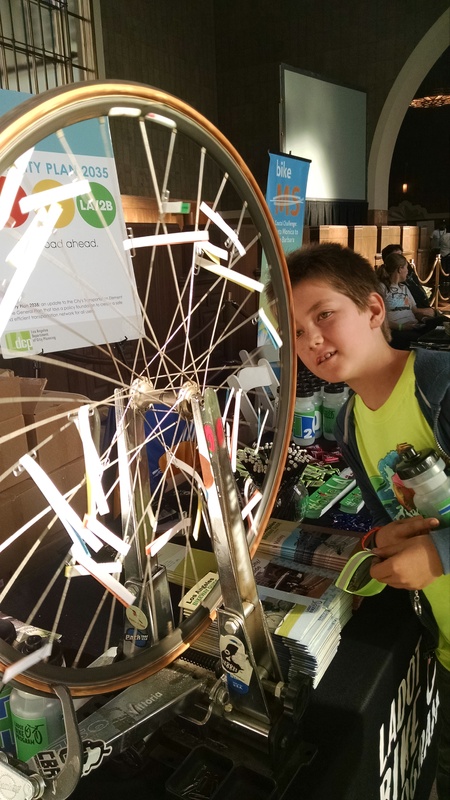 Since 2009, the Los Angeles County Bicycle Coalition (LACBC) has coordinated – with the help of volunteers – bicycle and pedestrian counts throughout Los Angeles to help measure changes in the level of cycling. The results of the LACBC’s most recent counts, from 2011, observed a tremendous increase in the amount of cycling compared to 2009, particularly on streets that received bike lanes in the time between the two counts. While studies across the nation have demonstrated that building bicycle infrastructure leads to increases in the level of cycling, the LACBC bike counts attach real numbers to actual streets and bike projects in Los Angeles. 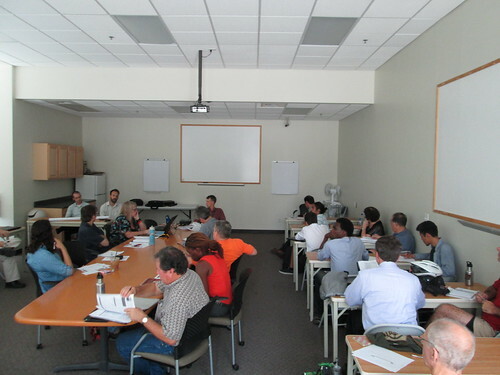 The LACBC is now in the process of coordinating bike counts for 2013. They are scheduled to take place on the 10th and 14th of September, and the LACBC needs your help to put together the most comprehensive and accurate bike counts yet. Because this year’s bike counts will be conducted shortly after over a hundred of new miles have been implemented and with highly anticipated road diets on the horizon, they are especially crucial from a data collection standpoint. The LACBC’s September bike counts will offer an indication of how effective the past fiscal year’s bike lanes have been while offering important “before” data for future bike lane projects. Ultimately, by simply continuing to count bicycle and pedestrian traffic, the LACBC will be collecting and compiling data the city unfortunately would not otherwise have, while reminding us not to overlook those walking and bicycling on our public streets. All modes of travel matter and deserve to be counted. If you can, please consider signing up to volunteer for the LACBC’s bike counts. The simple act of collecting accurate data on bicycle and pedestrian usage on our streets will simultaneously help educate Angelenos on the growing popularity of active transportation, evaluate the effectiveness of existing bikeways, and provide valuable data on streets slated for future bikeways. For more information on the LACBC’s September 2013 bike counts, click here– and to be directly linked to the LACBC bike count volunteer form, click here. 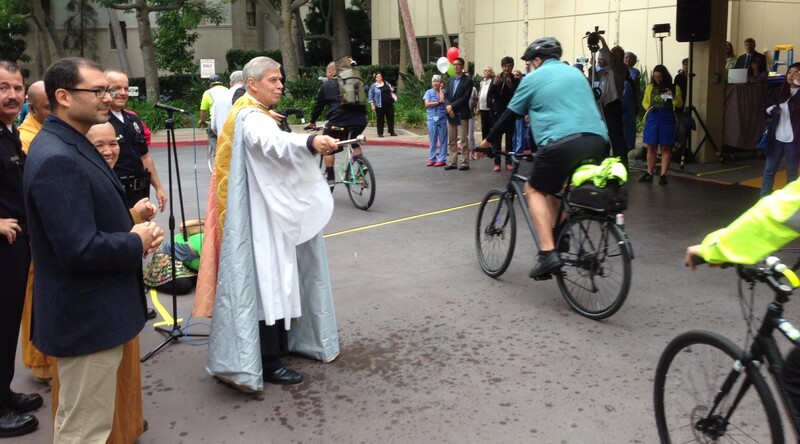 For those on facebook, check out the 2013 Bike Count event page. After you sign up to volunteer, you MUST choose a volunteer orientation session to attend. The LADOT Bike Blog is constantly on the lookout for great bicycle photography to include in our posts. We can’t be everywhere snapping pictures of every spoke or bicycle lane though. That’s where you come in. If you contribute your Los Angeles bicycle-related photography to our Flickr pool, we can use it in upcoming posts, putting your work in front of thousands of people (properly attributed, of course!). If you’re interested in contributing to the pool, join or login to Flickr. Then, join our Flickr pool and click “Add Photos” on the pool homepage. 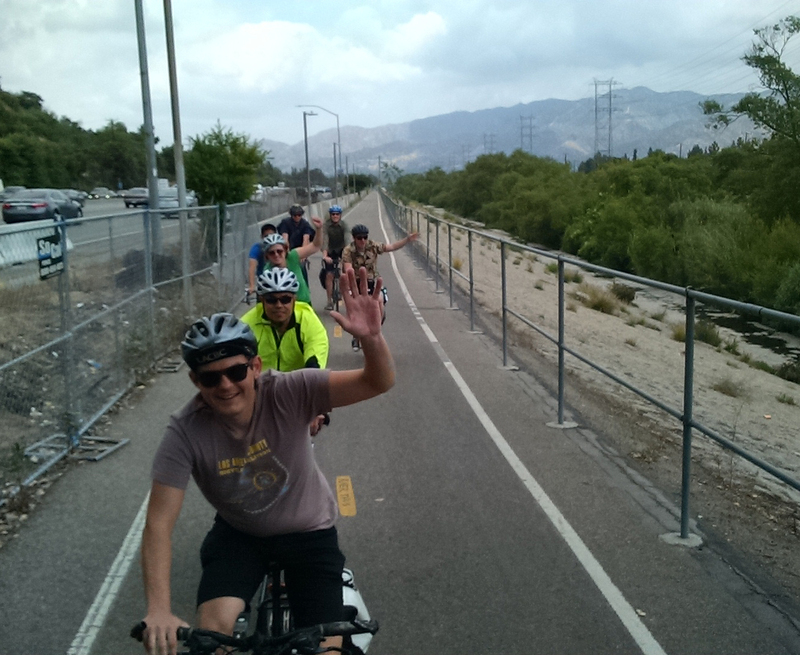 From there, you can send us as many photos as you like, provided they relate to bicycling in Los Angeles. Our goal to create a thriving community of Los Angeles bicycle-related photography, and we hope you join us! You may have heard at this morning’s CicLAvia press conference that the City of Los Angeles will soon be launching its very own bike share system. Details are still being worked out but we can confirm that Bike Nation USA – a local Southern California based firm – will launch and operate the system in collaboration with the city. The entire system will be privately launched and operated, and will not require any public funding. L.A.’s Bike Nation bike share system will be comprised of 400 kiosks, 6,500 docking stations, and 4,000 bicycles.